Adelaide - Skipper Michael Clarke said Australia are well placed in the run-up to this week's final Perth Test despite having to settle for a draw against South Africa in the second Test on Monday. The Australians spent almost nine hours in the field in Adelaide and bowled a total of 148 overs but could not dismiss the Proteas. Inspired by Test debutant Faf du Plessis, who ended on 110 not out, they batted out the entire fifth day to finish on 248 for eight. The first Test in Brisbane was also drawn. Australia must win in Perth to take the series and the world number one ranking from South Africa. Clarke was reminded of the parallels with Australia's inability to bowl out the last two batsmen, James Anderson and Monty Panesar, when England held on for a famous draw in the first Test of the 2009 Ashes series in Cardiff. "I like to hope there's a lot of difference to Cardiff. We didn't bowl to numbers 9 and 10 as long as we did in Cardiff," he said. "It is a great example of how hard a fight Test cricket is. Nothing is a given in this game. "You have to work your backside off to have success and it is even harder against the number one team in the world. "We didn't expect them to give us the game today. We knew we would have to fight. It was no different in Brisbane and it will be no different in Perth." 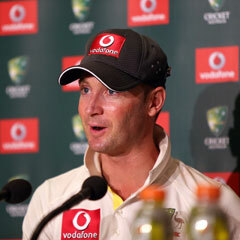 Clarke said Australia would have to be prepared to play their best cricket over five days if they were to win. But he added: "I am confident we will be in a good place come day one of the Perth Test." Clarke praised his bowlers' "amazing" efforts, despite being one strike bowler down with an injury to paceman James Pattinson for the final innings. "Losing James hurt us," he said. "I don't want to take anything away from South Africa because they played really well. "I thought Faf was outstanding on debut to make a hundred under conditions like that under pressure. The wicket played really well. "We tried everything in our power, we had a red-hot crack. It was unfortunate we didn't get over the line. But we didn't lose the Test, so we can take a lot of positives out of that. "We have to make sure physically we are as well prepared as we can for a crucial test in Perth."